Hello folks. 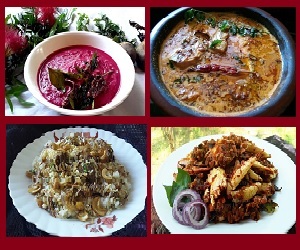 Weekend is coming and most of us are always looking for something special to cook during that time. 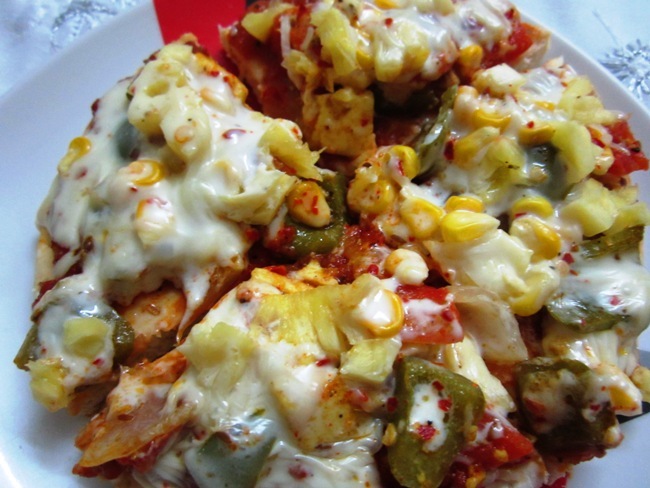 So today’s recipe is a vegetarian pizza recipe. Believe me when I say that this is a real treat for the vegetarians out there. It has everything you would want on your pizza. 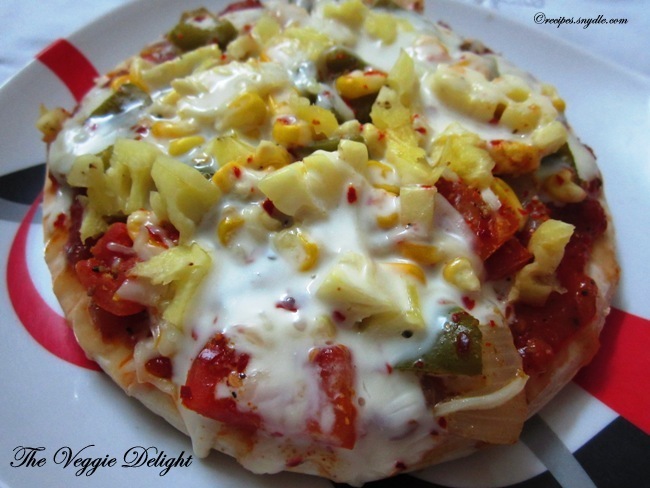 Hence the name – Veggie Delight Pizza. Making pizzas from scratch can be quite a task. So I suggest you do it like I do; make preparations ahead of time. I made the pizza dough and pizza sauce a day before. Apparently, pizza sauce does taste better the next day. I also marinated the paneer and veggies with yogurt and spices in the morning. 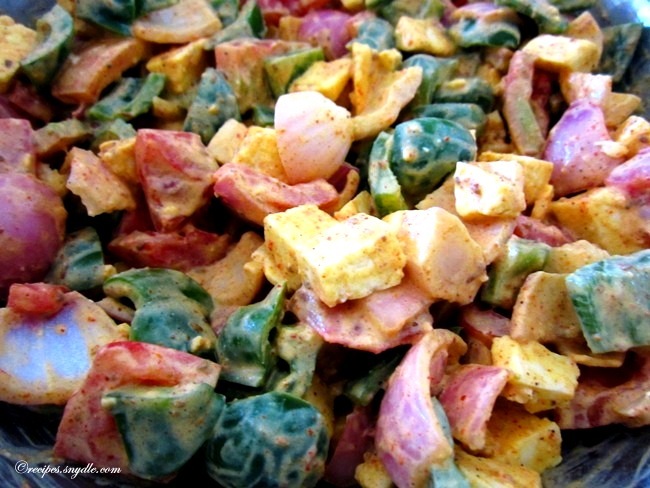 The veggies and paneer are supposed to be marinated for at least 3-4 hours for the tikka-like taste. Unfortunately, I didn’t have pickled green olives this time. They add such beautiful zing to the pizza. You should add some sliced pickled olives if you have them at hand. I used a lot of different veggies here. 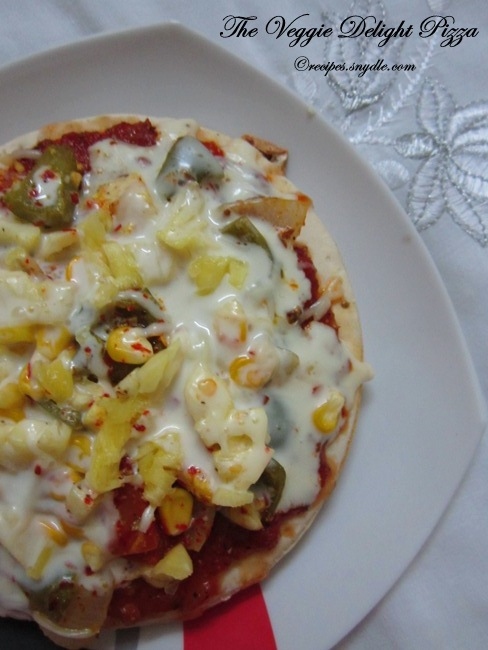 I used green bell pepper, onion, tomatoes, sweet corn, pickled jalapenos, and some pineapple for sweetness. I used a combination of mozzarella and cheddar cheese. I find that cheddar cheese melts well and enhances the taste of the pizza. You can play around with the toppings and cheese. Add whatever you like. My family prefers having personal pizzas instead of large pizzas. So I made small pizzas, must be about 7 inches I suppose. You can make large or medium pizzas too. This is going to a long post, so sit tight! Let’s start with the recipe now. For the purpose of measurement, 1 cup = 250 ml. This recipe yields 6 personal pizzas. Prepare the sauce and pizza dough a day in advance. You can add veggies and paneer without marination, but it might taste a little bland. The curd and spices really add a kick of taste to the veggies and cottage cheese. Soak the chopped onion in a bowl of cold for about 30 minutes. Change the water once if needed. This is important to remove the extra pungent flavor from the onion. Drain the onion well. Heat the olive oil in a saucepan and add in the bay leaf and onion. Saute till the onion becomes pink and it gets fragrant. Add in the minced garlic and saute for 2 minutes on a low flame till the raw smell disappears. Add in the pureed tomatoes. I kept the puree a bit chunky because I like the tomato bits. Since tomatoes have a lot of moisture, you won’t need to add any water. Allow the puree to cook on low flame for about 10-12 minutes so that it loses its raw smell. Once the raw smell is gone, add in the salt, oregano, basil, black pepper powder, red chili flakes and mix well. Cook for a minute and finish it with honey and tomato ketchup. The ketchup helps in emulsification of the pizza sauce. Turn the flame off and allow the sauce to cool a bit. Pizza sauce is ready to be used. 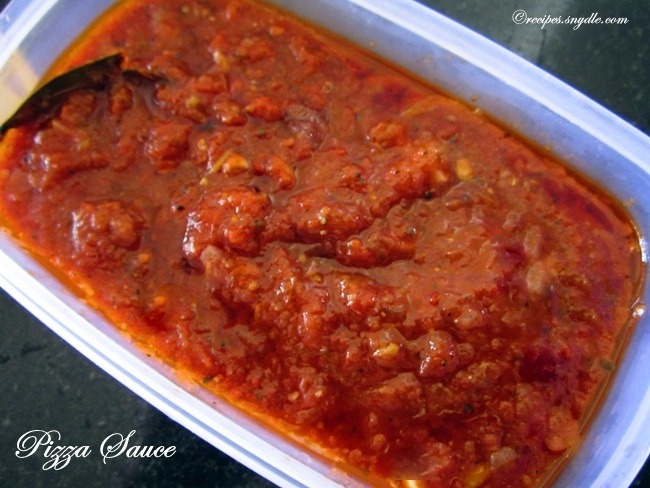 If storing in the refrigerator, cool the sauce and transfer it to an airtight container. I usually do not like to keep the sauce in the fridge beyond 2 days. Use it while the flavors are still fresh. I prefer to add a tad bit more oil so that the sauce won’t go bad. You can always scoop it out if you feel so. Take the lukewarm water in a bowl and add sugar and yeast to it and mix. Allow it to stand for 10 to 12 minutes. The yeast will prove and will have become frothy. Take care you do not take hot water instead of lukewarm, else it will kill the yeast. Now in another bowl take salt, oil and half the AFP / maida. Pour the yeast mixture to it and mix well using a spatula. Add the other half of the AFP / maida and keep mixing. The mixture will look like a sticky dough. Now apply some olive oil to the sticky dough and knead it on the kitchen top to get a smooth, soft and elastic dough. If the dough gets too sticky, add some AFP / maida to it. If it isn’t as soft, sprinkle some water while you knead it. Now keep the dough in a large bowl. Brush some oil over the dough and cover the bowl with a cling wrap. Keep the bowl someplace warm and allow it to leaven for 2 hours. After 2 hours, the dough will almost double up in size. If you wish to make the dough the night before as I did, wrap it in a cling wrap and refrigerate it. Thaw the dough for about an hour before using it to make pizzas. If you wish to make pizzas, lightly punch the dough a bit and proceed to make pizza bases by rolling out the dough. Divide the dough into 6 parts and roll them out to about 7 inches bases on a floured surface. The thickness will be about 1/2 cm. Prick the rolled out pizza bases uniformly with a fork several times. Whisk the hung curd till its smooth. Add in the salt, kasoori methi, lime juice, ginger-garlic paste, dry spice powders and mix well. Add in the paneer and diced veggies and mix well to coat the veggies in the curd. Let it marinate for at least 3 to 4 hours. The veggies will absorb the flavors and become tender as well. Pre-heat the oven at about 200 degrees for 20 minutes. After you have rolled out the pizza base, transfer it to a baking tray / pan that has been lightly greased and sprinkled with some cornmeal. You can fit about 2-3 pizza bases depending upon the size of your baking tray and oven. Brush some olive oil on the base to avoid it from becoming soggy from the pizza sauce. Spread the pizza sauce generously, about 3-4 tbsp on each base. Sprinkle at least 1/3 cup of cheese. 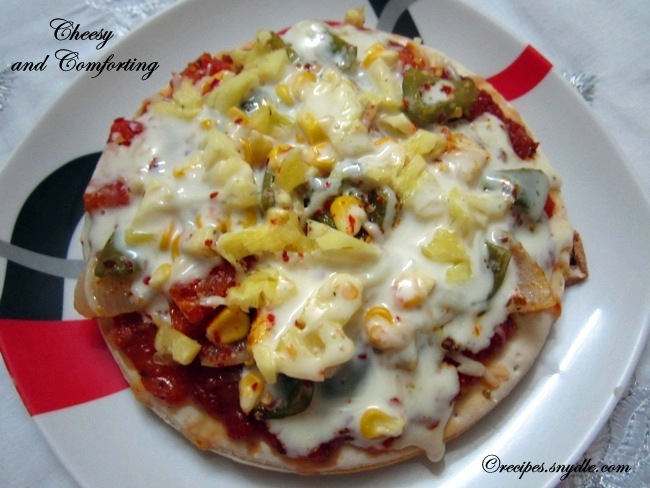 Spread the toppings; jalapenos, pineapple, sweet corn, marinated paneer, onions, tomatoes and bell pepper. Sprinkle some dried oregano and dried chili flakes as per your taste. Cover with another 1/3 cup of cheese. Place the baking tray / pan in the oven, preferably on the lower rack and bake the pizza for about 20 minutes. Keep an eye on your pizza while its baking to avoid over-cooking it. The base should be well baked, golden and crispy at the bottom, cheese melted and veggies well baked. 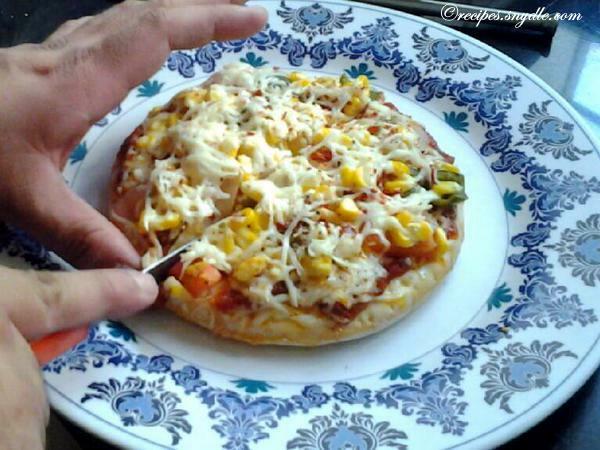 Allow the pizza to stand for about 3 minutes before you slice it. Veggie Delight Pizza is ready. Enjoy!